Evolocumab 140mg/mL; per prefilled syringe or SureClick autoinjector; soln for SC inj; preservative-free. Copyright © 2018 by RxList Inc. RxList does not provide medical advice, diagnosis or treatment. See additional information . Evolocumab is a human monoclonal immunoglobulin G2 (IgG2) directed against human proprotein convertase subtilisin kexin 9 (PCSK9). Evolocumab has an approximate molecular weight (MW) of 144 kDa and is produced in genetically engineered mammalian (Chinese hamster ovary) cells. REPATHA is a sterile, preservative-free, clear to opalescent, colorless to pale yellow solution for subcutaneous administration. Each 1 mL single-use prefilled syringe and single-use prefilled SureClick® autoinjector contains 140 mg evolocumab, acetate (1.2 mg), polysorbate 80 (0.1 mg), proline (25 mg) in Water for Injection, USP. Sodium hydroxide may be used to adjust to a pH of 5.0. Each single-use Pushtronex®system (on-body infusor with prefilled cartridge) delivers a 3.5 mL solution containing 420 mg evolocumab, acetate (4.2 mg), polysorbate 80 (0.35 mg), proline (89 mg) in Water for Injection, USP. Sodium hydroxide may be used to adjust to a pH of 5.0. In adults with established cardiovascular disease , REPATHA® is indicated to reduce the risk of myocardial infarction , stroke , and coronary revascularization. REPATHA is indicated as an adjunct to diet, alone or in combination with other lipid -lowering therapies (e.g., statins , ezetimibe ), for the treatment of adults with primary hyperlipidemia to reduce low-density lipoprotein cholesterol ( LDL -C). REPATHA is indicated as an adjunct to diet and other LDL-lowering therapies (e.g., statins, ezetimibe, LDL apheresis ) for the treatment of patients with homozygous familial hypercholesterolemia (HoFH) who require additional lowering of LDL-C. The recommended subcutaneous dosage of REPATHA in adults with established cardiovascular disease or in adults with primary hyperlipidemia (including heterozygous familial hypercholesterolemia [HeFH]) is either 140 mg every 2 weeks OR 420 mg once monthly, based on patient preference for dosing frequency and injection volume. When switching dosage regimens, administer the first dose of the new regimen on the next scheduled date of the prior regimen. When monitoring LDL-C for patients receiving REPATHA 420 mg once monthly, note that LDL-C can vary considerably during the dosing interval in some patients [see Clinical Studies ]. If a dose is missed, instruct the patient to administer REPATHA within 7 days from the missed dose and resume the patient’s original schedule. If an every-2-week dose is not administered within 7 days, instruct the patient to wait until the next dose on the original schedule. If a once-monthly dose is not administered within 7 days, instruct the patient to administer the dose and start a new schedule based on this date. by giving 3 injections consecutively within 30 minutes using the single-use prefilled autoinjector or single-use prefilled syringe. Provide proper training to patients and/or caregivers on how to prepare and administer REPATHA prior to use, according to the Instructions for Use, including aseptic technique. Instruct patients and/or caregivers to read and follow the Instructions for Use each time they use REPATHA. Keep REPATHA in the refrigerator. Prior to use, allow REPATHA to warm to room temperature for at least 30 minutes for the single-use prefilled autoinjector or single-use prefilled syringe and for at least 45 minutes for the single-use on-body infusor with prefilled cartridge. Do not warm in any other way. Alternatively, for patients and caregivers, REPATHA can be kept at room temperature at 68°F to 77°F (20°C to 25°C) in the original carton. However, under these conditions, REPATHA must be used within 30 days [see HOW SUPPLIED]. Visually inspect REPATHA for particles and discoloration prior to administration. REPATHA is a clear to opalescent, colorless to pale yellow solution. Do not use if the solution is cloudy or discolored or contains particles. Administer REPATHA subcutaneously into areas of the abdomen, thigh, or upper arm that are not tender, bruised, red, or indurated using a single-use prefilled syringe, single-use prefilled autoinjector, or single-use on-body infusor with prefilled cartridge. Do not co-administer REPATHA with other injectable drugs at the same administration site. Rotate the site of each subcutaneous administration. REPATHA is a sterile, clear to opalescent, colorless to pale yellow solution for subcutaneous administration supplied in a single-use prefilled syringe, a single-use prefilled SureClick® autoinjector, or a single-use Pushtronex® system (on-body infusor with prefilled cartridge). Each single-use prefilled syringe or single-use prefilled SureClick® autoinjector of REPATHA is designed to deliver 1 mL of 140 mg/mL solution. Each single-use Pushtronex® system (on-body infusor with prefilled cartridge) is designed to deliver 420 mg evolocumab in 3.5 mL solution. Store refrigerated at 2°C to 8°C (36° to 46°F) in the original carton to protect from light. Do not freeze. Store refrigerated at 2°C to 8°C (36° to 46°F) in the original carton. Alternatively, REPATHA can be kept at room temperature at 68°F to 77°F (20°C to 25°C) in the original carton; however, under these conditions, REPATHA must be used within 30 days. If not used within the 30 days, discard REPATHA. Protect REPATHA from direct light and do not expose to temperatures above 25°C (77°F). The data described below reflect exposure to REPATHA in 8 placebo-controlled trials that included 2651 patients treated with REPATHA, including 557 exposed for 6 months and 515 exposed for 1 year (median treatment duration of 12 weeks). The mean age of the population was 57 years, 49% of the population were women, 85% White, 6% Black, 8% Asians, and 2% other races. In a 52-week, double-blind, randomized, placebo-controlled trial (Study 3 [DESCARTES, NCT01516879]), 599 patients received 420 mg of REPATHA subcutaneously once monthly [see Clinical Studies ]. The mean age was 56 years (range: 22 to 75 years), 23% were older than 65 years, 52% women, 80% White, 8% Black, 6% Asian; 6% identified as Hispanic ethnicity. Adverse reactions reported in at least 3% of REPATHA-treated patients, and more frequently than in placebo-treated patients in DESCARTES, are shown in Table 1. Adverse reactions led to discontinuation of treatment in 2.2% of REPATHA-treated patients and 1% of placebo-treated patients. The most common adverse reaction that led to REPATHA treatment discontinuation and occurred at a rate greater than placebo was myalgia (0.3% versus 0% for REPATHA and placebo, respectively). In seven pooled 12-week, double-blind, randomized, placebo-controlled trials, 993 patients received 140 mg of REPATHA subcutaneously every 2 weeks and 1059 patients received 420 mg of REPATHA subcutaneously monthly. The mean age was 57 years (range: 18 to 80 years), 29% were older than 65 years, 49% women, 85% White, 5% Black, 9% Asian; 5% identified as Hispanic ethnicity. Adverse reactions reported in at least 1% of REPATHA-treated patients, and more frequently than in placebo-treated patients, are shown in Table 2. The adverse reactions described below are from a pool of the 52-week trial (DESCARTES) and seven 12-week trials. The mean and median exposure durations of REPATHA in this pool of eight trials were 20 weeks and 12 weeks, respectively. Injection site reactions occurred in 3.2% and 3.0% of REPATHA-treated and placebo-treated patients, respectively. The most common injection site reactions were erythema, pain, and bruising. The proportions of patients who discontinued treatment due to local injection site reactions in REPATHA-treated patients and placebo-treated patients were 0.1% and 0%, respectively. In a double-blind, randomized, placebo-controlled cardiovascular outcomes trial (Study 1 [REPATHA Cardiovascular Outcomes Trial, FOURIER, NCT01764633]), 27,525 patients received at least one dose of REPATHA or placebo [see Clinical Studies ]. The mean age was 62.5 years (range: 40 to 86 years), 45% were 65 years or older, 9% were 75 years or older, 25% women, 85% White, 2% Black and 10% Asian; 8% identified as Hispanic ethnicity. Patients were exposed to REPATHA or placebo for a median of 24.8 months; 91% of patients were exposed for ≥ 12 months, 54% were exposed for ≥ 24 months and 5% were exposed for ≥ 36 months. tract infection (5.1% REPATHA, 4.8% placebo). As with all therapeutic proteins, there is potential for immunogenicity. The detection of antibody formation is highly dependent on the sensitivity and specificity of the assay. Additionally, the observed incidence of antibody (including neutralizing antibody) positivity in an assay may be influenced by several factors including assay methodology, sample handling, timing of sample collection, concomitant medications, and underlying disease. For these reasons, comparison of the incidence of antibodies to REPATHA in the studies described below with the incidence of antibodies in other studies or to other products may be misleading. The immunogenicity of REPATHA has been evaluated using an electrochemiluminescent bridging screening immunoassay for the detection of binding anti-drug antibodies. For patients whose sera tested positive in the screening immunoassay, an in vitro biological assay was performed to detect neutralizing antibodies. In a pool of placebo-and active-controlled clinical trials, 0.3% (48 out of 17,992) of patients treated with at least one dose of REPATHA tested positive for the development of binding antibodies. Patients whose sera tested positive for binding antibodies were further evaluated for neutralizing antibodies; none of the patients tested positive for neutralizing antibodies. There was no evidence that the presence of anti-drug binding antibodies impacted the pharmacokinetic profile, clinical response, or safety of REPATHA, but the long-term consequences of continuing REPATHA treatment in the presence of anti-drug binding antibodies are unknown. Hypersensitivity reactions (e.g., rash, urticaria ) have been reported in patients treated with REPATHA, including some that led to discontinuation of therapy. If signs or symptoms of serious allergic reactions occur, discontinue treatment with REPATHA, treat according to the standard of care , and monitor until signs and symptoms resolve. Advise the patient and/or caregiver to read the FDA-approved patient labeling [ PATIENT INFORMATION and Instructions for Use (IFU)] before the patient starts using REPATHA, and each time the patient gets a refill as there may be new information they need to know. Provide guidance to patients and caregivers on proper subcutaneous administration technique, including aseptic technique, and how to use the single-use prefilled autoinjector, single-use prefilled syringe, or single-use on-body infusor with prefilled cartridge correctly (see Instructions for Use leaflet). Inform patients that it may take up to 15 seconds to administer REPATHA using the single-use prefilled autoinjector or single-use prefilled syringe and about 9 minutes to administer REPATHA using the single-use on-body infusor with prefilled cartridge. Advise latex-sensitive patients that the following components contain dry natural rubber (a derivative of latex) that may cause allergic reactions in individuals sensitive to latex: the needle cover of the glass single-use prefilled syringe and the single-use prefilled autoinjector. The single-use on-body infusor with prefilled cartridge is not made with natural rubber latex. For more information about REPATHA, go to www.REPATHA.com or call 1-844-REPATHA (1-844-737-2842). The carcinogenic potential of evolocumab was evaluated in a lifetime study conducted in the hamster at dose levels of 10, 30, and 100 mg/kg administered every 2 weeks. There were no evolocumab-related tumors at the highest dose at systemic exposures up to 38-and 15-fold the recommended human doses of 140 mg every 2 weeks and 420 mg once monthly, respectively, based on plasma AUC. The mutagenic potential of evolocumab has not been evaluated; however, monoclonal antibodies are not expected to alter DNA or chromosomes . There were no adverse effects on fertility (including estrous cycling, sperm analysis, mating performance, and embryonic development) at the highest dose in a fertility and early embryonic developmental toxicology study in hamsters when evolocumab was subcutaneously administered at 10, 30, and 100 mg/kg every 2 weeks. The highest dose tested corresponds to systemic exposures up to 30-and 12-fold the recommended human doses of 140 mg every 2 weeks and 420 mg once monthly, respectively, based on plasma AUC. In addition, there were no adverse evolocumab-related effects on surrogate markers of fertility (reproductive organ histopathology, menstrual cycling, or sperm parameters) in a 6-month chronic toxicology study in sexually mature monkeys subcutaneously administered evolocumab at 3, 30, and 300 mg/kg once weekly. The highest dose tested corresponds to 744-and 300-fold the recommended human doses of 140 mg every 2 weeks and 420 mg once monthly, respectively, based on plasma AUC. Pregnancy Exposure Registry There is a pregnancy exposure registry that monitors pregnancy outcomes in women exposed to REPATHA during pregnancy. Please contact 1-877-311-8972 or https://mothertobaby.org/ongoing-study/repatha/ to enroll in or to obtain information about the registry. There are no data available on use of REPATHA in pregnant women to inform a drug-associated risk. In animal reproduction studies, there were no effects on pregnancy or neonatal /infant development when monkeys were subcutaneously administered evolocumab from organogenesis through parturition at dose exposures up to 12 times the exposure at the maximum recommended human dose of 420 mg every month. In a similar study with another drug in the PCSK9 inhibitor antibody class, humoral immune suppression was observed in infant monkeys exposed to that drug in utero at all doses. The exposures where immune suppression occurred in infant monkeys were greater than those expected clinically. No assessment for immune suppression was conducted with evolocumab in infant monkeys. Measurable evolocumab serum concentrations were observed in the infant monkeys at birth at comparable levels to maternal serum, indicating that evolocumab, like other IgG antibodies, crosses the placental barrier. FDA’s experience with monoclonal antibodies in humans indicates that they are unlikely to cross the placenta in the first trimester; however, they are likely to cross the placenta in increasing amounts in the second and third trimester. Consider the benefits and risks of REPATHA and possible risks to the fetus before prescribing REPATHA to pregnant women. In the U.S. general population, the estimated background risk of major birth defects and miscarriage in clinically recognized pregnancies is 2-4% and 15-20%, respectively. In cynomolgus monkeys, no effects on embryo-fetal or postnatal development (up to 6 months of age) were observed when evolocumab was dosed during organogenesis to parturition at 50 mg/kg once every 2 weeks by the subcutaneous route at exposures 30-and 12-fold the recommended human doses of 140 mg every 2 weeks and 420 mg once monthly, respectively, based on plasma AUC. No test of humoral immunity in infant monkeys was conducted with evolocumab. There is no information regarding the presence of evolocumab in human milk, the effects on the breastfed infant, or the effects on milk production. The development and health benefits of breastfeeding should be considered along with the mother’s clinical need for REPATHA and any potential adverse effects on the breastfed infant from REPATHA or from the underlying maternal condition. Human IgG is present in human milk, but published data suggest that breast milk antibodies do not enter the neonatal and infant circulation in substantial amounts. The safety and effectiveness of REPATHA in combination with diet and other LDL -C-lowering therapies in adolescents with HoFH who require additional lowering of LDL-C were established based on data from a 12-week, placebo-controlled trial that included 10 adolescents (ages 13 to 17 years old) with HoFH [see Clinical Studies ]. In this trial, 7 adolescents received REPATHA 420 mg subcutaneously once monthly and 3 adolescents received placebo. The effect of REPATHA on LDL-C was generally similar to that observed among adult patients with HoFH. Including experience from open-label, uncontrolled studies, a total of 14 adolescents with HoFH have been treated with REPATHA, with a median exposure duration of 9 months. The safety profile of REPATHA in these adolescents was similar to that described for adult patients with HoFH. In controlled trials, 7656 (41%) patients treated with REPATHA were ≥ 65 years old and 1500 (8%) were ≥ 75 years old. No overall differences in safety or effectiveness were observed between these patients and younger patients, and other reported clinical experience has not identified differences in responses between the elderly and younger patients, but greater sensitivity of some older individuals cannot be ruled out. No dose adjustment is needed in patients with renal impairment. [see CLINICAL PHARMACOLOGY ]. No dose adjustment is needed in patients with mild to moderate hepatic impairment (Child-Pugh A or B). No data are available in patients with severe hepatic impairment [see CLINICAL PHARMACOLOGY ]. REPATHA is contraindicated in patients with a history of a serious hypersensitivity reaction to REPATHA [see WARNINGS AND PRECAUTIONS ]. Evolocumab is a human monoclonal IgG2 directed against human proprotein convertase subtilisin kexin 9 (PCSK9). Evolocumab binds to PCSK9 and inhibits circulating PCSK9 from binding to the low density lipoprotein ( LDL ) receptor (LDLR), preventing PCSK9-mediated LDLR degradation and permitting LDLR to recycle back to the liver cell surface. By inhibiting the binding of PCSK9 to LDLR, evolocumab increases the number of LDLRs available to clear LDL from the blood, thereby lowering LDL-C levels. Following single subcutaneous administration of 140 mg or 420 mg of evolocumab, maximum suppression of circulating unbound PCSK9 occurred by 4 hours. Unbound PCSK9 concentrations returned toward baseline when evolocumab concentrations decreased below the limit of quantitation. resulted in a Cmax mean (SD) of 59.0 (17.2) μg/mL and AUClast mean (SD) of 924 (346) day•μg/mL. concentrations approached steady state by 12 weeks of dosing. Following a single 420 mg intravenous dose, the mean (SD) steady-state volume of distribution was estimated to be 3.3 (0.5) L.
Two elimination phases were observed for REPATHA. At low concentrations, the elimination is predominately through saturable binding to target (PCSK9), while at higher concentrations the elimination of REPATHA is largely through a non-saturable proteolytic pathway. REPATHA was estimated to have an effective half-life of 11 to 17 days. The pharmacokinetics of evolocumab were not affected by age, gender, race, or creatinine clearance across all approved populations [see Use In Specific Populations ]. The exposure of evolocumab decreased with increasing body weight. These differences are not clinically meaningful. Since monoclonal antibodies are not known to be eliminated via renal pathways, renal function is not expected to impact the pharmacokinetics of evolocumab. In a clinical trial of 18 patients with either normal renal function (estimated glomerular filtration rate [eGFR] ≥ 90 mL/min/1.73 m2, n=6), severe renal impairment (eGFR < 30 mL/min/1.73 m2, n=6), or end-stage renal disease ( ESRD ) receiving hemodialysis (n=6), exposure to evolocumab after a single 140 mg subcutaneous dose was decreased in patients with severe renal impairment or ESRD receiving hemodialysis. Reductions in PCSK9 levels in patients with severe renal impairment or ESRD receiving hemodialysis was similar to those with normal renal function [see Use In Specific Populations ]. Following a single 140 mg subcutaneous dose of evolocumab in patients with mild or moderate hepatic impairment, a 20-30% lower mean Cmax and 40-50% lower mean AUC were observed as compared to healthy patients; however, no dose adjustment is necessary in these patients. The effect of pregnancy on evolocumab pharmacokinetics has not been studied [see Use In Specific Populations ]. An approximately 20% decrease in the Cmax and AUC of evolocumab was observed in patients co-administered with a high-intensity statin regimen. This difference is not clinically meaningful and does not impact dosing recommendations. During a 3-month toxicology study of 10 and 100 mg/kg once every 2 weeks evolocumab in combination with 5 mg/kg once daily rosuvastatin in adult monkeys, there were no effects of evolocumab on the humoral immune response to keyhole limpet hemocyanin (KLH) after 1 to 2 months exposure. The highest dose tested corresponds to exposures 54-and 21-fold higher than the recommended human doses of 140 mg every 2 weeks and 420 mg once monthly, respectively, based on plasma AUC. Similarly, there were no effects of evolocumab on the humoral immune response to KLH (after 3 to 4 months exposure) in a 6-month study in cynomolgus monkeys at dose levels up to 300 mg/kg once weekly evolocumab corresponding to exposures 744-and 300-fold greater than the recommended human doses of 140 mg every 2 weeks and 420 mg once monthly, respectively, based on plasma AUC. Study 1 (FOURIER, NCT01764633) was a double-blind, randomized, placebo-controlled, event-driven trial in 27,564 (13,784 REPATHA, 13,780 placebo) adult patients with established cardiovascular disease and with LDL-C ≥70 mg/dL and/or non- HDL -C ≥100 mg/dL despite high-or moderate-intensity statin therapy. Patients were randomly assigned 1:1 to receive either subcutaneous injections of REPATHA (140 mg every 2 weeks or 420 mg once monthly) or placebo; 86% used the every-2-week regimen throughout the trial. The median follow-up duration was 26 months. Overall, 99.2% of patients were followed until the end of the trial or death. The mean (SD) age at baseline was 63 (9) years, with 45% being at least 65 years old; 25% were women. The trial population was 85% White, 2% Black, and 10% Asian; 8% identified as Hispanic ethnicity. Regarding prior diagnoses of cardiovascular disease, 81% had prior myocardial infarction , 19% prior non- hemorrhagic stroke , and 13% had symptomatic peripheral arterial disease. Selected additional baseline risk factors included hypertension (80%), diabetes mellitus (1% type 1; 36% type 2), current daily cigarette smoking (28%), New York Heart Association class I or II congestive heart failure (23%), and eGFR < 60 mL/min per 1.73 m2 (6%). Most patients were on a high-(69%) or moderate-intensity (30%) statin therapy at baseline, and 5% were also taking ezetimibe . Most patients were taking at least one other cardiovascular medication including anti-platelet agents (93%), beta blockers (76%), angiotensin converting enzyme (ACE) inhibitors (56%), or angiotensin receptor blockers (23%). On stable background lipid -lowering therapy, the median [Q1, Q3] LDL-C at baseline was 92 [80, 109] mg/dL; the mean (SD) was 98 (28) mg/dL. REPATHA significantly reduced the risk for the primary composite endpoint (time to first occurrence of cardiovascular death, myocardial infarction , stroke, hospitalization for unstable angina , or coronary revascularization; p<0.0001) and the key secondary composite endpoint (time to first occurrence of cardiovascular death, myocardial infarction, or stroke; p<0.0001). The Kaplan-Meier estimates of the cumulative incidence of the primary and key secondary composite endpoints over time are shown in Figure 1 and Figure 2 below. The results of primary and secondary efficacy endpoints are shown in Table 3 below. aTime to death by any cause is not a component of either the primary composite endpoint or key secondary composite endpoint. b Not a prespecified endpoint; an ad hoc analysis was performed to ensure results are provided for each individual component of the primary endpoint. The difference between REPATHA and placebo in mean percent change in LDL-C from baseline to Week 12 was -63% (95% CI: -63%, -62%) and from baseline to Week 72 was -57% (95% CI: -58%, -56%). At Week 48, the median [Q1, Q3] LDL-C was 26 [15, 46] mg/dL in the REPATHA group, with 47% of patients having LDL-C <25 mg/dL. Considering all assessments, among the patients treated with REPATHA, 10401 (76%) had at least one LDL-C value < 25 mg/dL. Although not a randomized comparison, the safety profile was similar between REPATHA-treated patients with post-baseline LDL-C < 25 mg/dL compared with REPATHA-treated patients with higher post-baseline LDL-C (LDL-C ≥ 40 mg/dL). In EBBINGHAUS (NCT02207634), a substudy of 1974 patients enrolled in the FOURIER trial, REPATHA was non- inferior to placebo on selected cognitive function domains as assessed with the use of neuropsychological function tests over a median follow-up of 19 months. Study 2 (LAPLACE-2, NCT01763866) was a multicenter, double-blind, randomized controlled 12-week trial in which patients were initially randomized to an open-label specific statin regimen for a 4-week lipid stabilization period followed by random assignment to subcutaneous injections of REPATHA 140 mg every 2 weeks, REPATHA 420 mg once monthly, or placebo for 12 weeks. The trial included 1896 patients with hyperlipidemia who received REPATHA, placebo, or ezetimibe as add-on therapy to daily doses of statins ( atorvastatin , rosuvastatin, or simvastatin ). Ezetimibe was also included as an active control only among those assigned to background atorvastatin. Overall, the mean age at baseline was 60 years (range: 20 to 80 years), 35% were ≥ 65 years old, 46% women, 94% White, 4% were Black, and 1% Asian; 5% identified as Hispanic or Latino ethnicity. After 4 weeks of background statin therapy, the mean baseline LDL-C ranged between 77 and 127 mg/dL across the five background therapy arms. CI: -52%, -39%; p < 0.0001) and -41% (95% CI: -47%, -35%; p < 0.0001) for the 140 mg every 2 weeks and 420 mg once monthly dosages, respectively. For additional results see Table 4 and Figure 3. Estimates based on a multiple imputation model that accounts for treatment adherence. Study 3 (DESCARTES, NCT01516879) was a multicenter, double-blind, randomized, placebo-controlled, 52-week trial that included 901 patients with hyperlipidemia who received protocol-determined background lipid-lowering therapy of a cholesterol-lowering diet either alone or in addition to atorvastatin (10 mg or 80 mg daily) or the combination of atorvastatin 80 mg daily with ezetimibe. After stabilization on background therapy, patients were randomly assigned to the addition of placebo or REPATHA 420 mg administered subcutaneously once monthly. Overall, the mean age at baseline was 56 years (range: 25 to 75 years), 23% were ≥ 65 years, 52% women, 80% White, 8% Black, and 6% Asian; 6% identified as Hispanic or Latino ethnicity. After stabilization on the assigned background therapy, the mean baseline LDL-C ranged between 90 and 117 mg/dL across the four background therapy groups. In these patients with hyperlipidemia on a protocol-determined background therapy, the difference between REPATHA 420 mg once monthly and placebo in mean percent change in LDL-C from baseline to Week 52 was -55% (95% CI: -60%, -50%; p < 0.0001) (Table 5 and Figure 4). For additional results see Table 5. *Prior to randomization , patients were stabilized on background therapy consisting of a cholesterol-lowering diet either alone or in addition to atorvastatin (10 mg or 80 mg daily) or the combination of atorvastatin 80 mg daily with ezetimibe. Study 4 (MENDEL-2, NCT01763827) was a multicenter, double-blind, randomized, placebo-and active-controlled, 12-week trial that included 614 patients with hyperlipidemia who were not taking lipid-lowering therapy at baseline. Patients were randomly assigned to receive subcutaneous injections of REPATHA 140 mg every 2 weeks, REPATHA 420 mg once monthly, or placebo for 12 weeks. Blinded administration of ezetimibe was also included as an active control. Overall, the mean age at baseline was 53 years (range: 20 to 80 years), 18% were ≥ 65 years old, 66% were women, 83% White, 7% Black, and 9% Asian; 11% identified as Hispanic or Latino ethnicity. The mean baseline LDL-C was 143 mg/dL. CI: -42%, -32%; p < 0.0001) and -38% (95% CI: -42%, -34%; p < 0.0001) for the 140 mg every 2 weeks and 420 mg once monthly dosages, respectively. For additional results see Table 6. Study 5 (RUTHERFORD-2, NCT01763918) was a multicenter, double-blind, randomized, placebo-controlled, 12-week trial in 329 patients with heterozygous familial hypercholesterolemia (HeFH) on statins with or without other lipid-lowering therapies. Patients were randomized to receive subcutaneous injections of REPATHA 140 mg every two weeks, 420 mg once monthly, or placebo. HeFH was diagnosed by the Simon Broome criteria (1991). In Study 5, 38% of patients had clinical atherosclerotic cardiovascular disease. The mean age at baseline was 51 years (range: 19 to 79 years), 15% of the patients were ≥ 65 years old, 42% were women, 90% were White, 5% were Asian, and 1% were Black. The average LDL-C at baseline was 156 mg/dL with 76% of the patients on high-intensity statin therapy. The differences between REPATHA and placebo in mean percent change in LDL-C from baseline to Week 12 was -61% (95% CI: -67%, -55%; p < 0.0001) and -60% (95% CI: -68%, -52%; p < 0.0001) for the 140 mg every 2 weeks and 420 mg once monthly dosages, respectively. For additional results see Table 7 and Figure 5. Study 6 (TESLA, NCT01588496) was a multicenter, double-blind, randomized, placebo-controlled, 12-week trial in 49 patients (not on lipid- apheresis therapy) with homozygous familial hypercholesterolemia (HoFH). In this trial, 33 patients received subcutaneous injections of 420 mg of REPATHA once monthly and 16 patients received placebo as an adjunct to other lipid-lowering therapies (e.g., statins, ezetimibe). The mean age at baseline was 31 years, 49% were women, 90% White, 4% were Asian, and 6% other. The trial included 10 adolescents (ages 13 to 17 years), 7 of whom received REPATHA. The mean LDL-C at baseline was 349 mg/dL with all patients on statins (atorvastatin or rosuvastatin) and 92% on ezetimibe. The diagnosis of HoFH was made by genetic confirmation or a clinical diagnosis based on a history of an untreated LDL-C concentration > 500 mg/dL together with either xanthoma before 10 years of age or evidence of HeFH in both parents. The difference between REPATHA and placebo in mean percent change in LDL-C from baseline to Week 12 was -31% (95% CI: -44%, -18%; p < 0.0001). For additional results see Table 8. Patients known to have two LDL-receptor negative alleles (little to no residual function) did not respond to REPATHA. Each pre-filled syringe contains 140 mg of evolocumab in 1 mL of solution. Each pre-filled pen contains 140 mg of evolocumab in 1 mL of solution. Each cartridge contains 420 mg of evolocumab in 3.5 mL of solution (120 mg/mL). Repatha is a human IgG2 monoclonal antibody produced using recombinant DNA technology in Chinese hamster ovary (CHO) cells. Solution for injection (injection) (SureClick). Solution for injection (injection) (automated mini-doser). The solution is clear to opalescent, colourless to yellowish, and practically free from particles. • alone or in combination with other lipid-lowering therapies in patients who are statin-intolerant, or for whom a statin is contraindicated. Repatha is indicated in adults and adolescents aged 12 years and over with homozygous familial hypercholesterolaemia in combination with other lipid-lowering therapies. For study results with respect to effects on LDL-C, cardiovascular events and populations studied see section 5.1. Prior to initiating Repatha, secondary causes of hyperlipidaemia or mixed dyslipidaemia (e.g., nephrotic syndrome, hypothyroidism) should be excluded. The recommended dose of Repatha is either 140 mg every two weeks or 420 mg once monthly; both doses are clinically equivalent. The initial recommended dose is 420 mg once monthly. After 12 weeks of treatment, dose frequency can be up-titrated to 420 mg once every 2 weeks if a clinically meaningful response is not achieved. Patients on apheresis may initiate treatment with 420 mg every two weeks to correspond with their apheresis schedule. No dose adjustment is necessary in patients with mild to moderate renal impairment, see section 4.4 for patients with severe renal impairment (eGFR < 30 mL/min/1.73 m2). No dose adjustment is necessary in patients with mild hepatic impairment, see section 4.4 for patients with moderate and severe hepatic impairment. No dose adjustment is necessary in elderly patients. The safety and efficacy of Repatha in children aged less than 18 years has not been established in the indication for primary hypercholesterolaemia and mixed dyslipidaemia. No data are available. The safety and efficacy of Repatha in children aged less than 12 years has not been established in the indication for homozygous familial hypercholesterolaemia. No data are available. Repatha is for subcutaneous injection into the abdomen, thigh or upper arm region. Injection sites should be rotated and injections should not be given into areas where the skin is tender, bruised, red, or hard. Repatha must not be administered intravenously or intramuscularly. The 140 mg dose should be delivered using a single pre-filled syringe. The 420 mg dose should be delivered using three pre-filled syringes administered consecutively within 30 minutes. The 140 mg dose should be delivered using a single pre-filled pen. The 420 mg dose should be delivered using three pre-filled pens administered consecutively within 30 minutes. The 420 mg dose should be delivered using a single cartridge with the automated mini-doser. Repatha is intended for patient self-administration after proper training. Administration of Repatha can also be performed by an individual who has been trained to administer the product. For instructions on administration, see section 6.6 and the ‘Instructions for Use’ provided in the carton. There is limited experience with Repatha in patients with severe renal impairment (defined as eGFR < 30 mL/min/1.73 m2) (see section 5.2). Repatha should be used with caution in patients with severe renal impairment. In patients with moderate hepatic impairment, a reduction in total evolocumab exposure was observed that may lead to a reduced effect on LDL-C reduction. Therefore, close monitoring may be warranted in these patients. Patients with severe hepatic impairment (Child-Pugh C) have not been studied (see section 5.2). Repatha should be used with caution in patients with severe hepatic impairment. The needle cover of the glass pre-filled syringe is made from dry natural rubber (a derivative of latex), which may cause allergic reactions. The needle cover of the pre-filled pen is made from dry natural rubber (a derivative of latex), which may cause allergic reactions. This medicinal product contains less than 1 mmol sodium (23 mg) per dose, i.e. it is essentially ‘sodium-free’. No formal drug-drug interaction studies have been conducted for Repatha. The pharmacokinetic interaction between statins and evolocumab was evaluated in the Repatha clinical trials. An approximately 20% increase in the clearance of evolocumab was observed in patients co-administered statins. This increased clearance is in part mediated by statins increasing the concentration of Proprotein Convertase Subtilisin/Kexin Type 9 (PCSK9) which did not adversely impact the pharmacodynamic effect of evolocumab on lipids. No statin dose adjustments are necessary when used in combination with Repatha. No studies on pharmacokinetic and pharmacodynamics interaction between Repatha and lipid-lowering drugs other than statins and ezetimibe have been conducted. There are no or limited amount of data from the use of Repatha in pregnant women. Animal studies do not indicate direct or indirect effects with respect to reproductive toxicity (see section 5.3). Repatha should not be used during pregnancy unless the clinical condition of the woman requires treatment with evolocumab. It is unknown whether evolocumab is excreted in human milk. A risk to breastfed newborns/infants cannot be excluded. A decision must be made whether to discontinue breast-feeding or discontinue/abstain from Repatha therapy taking into account the benefit of breast-feeding for the child and the benefit of therapy for the woman. No data on the effect of evolocumab on human fertility are available. Animal studies did not show any effects on fertility endpoints at area under the concentration time curve (AUC) exposure levels much higher than in patients receiving evolocumab at 420 mg once monthly (see section 5.3). Repatha has no known influence on the ability to drive and use machines. The most commonly reported adverse reactions during pivotal trials, at the recommended doses, were nasopharyngitis (7.4%), upper respiratory tract infection (4.6%), back pain (4.4%), arthralgia (3.9%), influenza (3.2%), and injection site reactions (2.2%). The safety profile in the homozygous familial hypercholesterolaemia population was consistent with that demonstrated in the primary hypercholesterolaemia and mixed dyslipidaemia population. Adverse reactions reported in pivotal, controlled clinical studies are displayed by system organ class and frequency in table 1 below using the following convention: very common (≥ 1/10), common (≥ 1/100 to < 1/10), uncommon (≥ 1/1,000 to < 1/100), rare (≥ 1/10,000 to < 1/1,000) and very rare (< 1/10,000). The most frequent injection site reactions were injection site bruising, erythema, haemorrhage, injection site pain, and swelling. There is limited experience with Repatha in paediatric patients. Fourteen patients aged ≥ 12 to < 18 years with homozygous familial hypercholesterolaemia were included in clinical studies. No difference in safety was observed between adolescent and adult patients with homozygous familial hypercholesterolaemia. The safety and effectiveness of Repatha in paediatric patients with primary hypercholesterolaemia and mixed dyslipidaemia has not been established. Of the 18,546 patients treated with Repatha in double-blind clinical studies 7,656 (41.3%) were ≥ 65 years old, while 1,500 (8.1%) were ≥ 75 years old. No overall differences in safety or efficacy were observed between these patients and younger patients. In clinical studies, 0.3% of patients (48 out of 17,992 patients) treated with at least one dose of Repatha tested positive for binding antibody development. The patients whose sera tested positive for binding antibodies were further evaluated for neutralising antibodies and none of the patients tested positive for neutralising antibodies. The presence of anti-evolocumab binding antibodies did not impact the pharmacokinetic profile, clinical response, or safety of Repatha. No adverse effects were observed in animal studies at exposures up to 300-fold higher than those in patients treated with Repatha at 420 mg once monthly. There is no specific treatment for Repatha overdose. In the event of an overdose, the patient should be treated symptomatically, and supportive measures instituted as required. Evolocumab binds selectively to PCSK9 and prevents circulating PCSK9 from binding to the low density lipoprotein receptor (LDLR) on the liver cell surface, thus preventing PCSK9-mediated LDLR degradation. Increasing liver LDLR levels results in associated reductions in serum LDL-cholesterol (LDL-C). In clinical trials, Repatha reduced unbound PCSK9, LDL-C, TC, ApoB, non-HDL-C, TC/HDL-C, ApoB/ApoA1, VLDL-C, TG and Lp(a), and increased HDL-C and ApoA1 in patients with primary hypercholesterolaemia and mixed dyslipidaemia. A single subcutaneous administration of Repatha 140 mg or 420 mg resulted in maximum suppression of circulating unbound PCSK9 by 4 hours followed by a reduction in LDL-C reaching a mean nadir in response by 14 and 21 days, respectively. Changes in unbound PCSK9 and serum lipoproteins were reversible upon discontinuation of Repatha. No increase in unbound PCSK9 or LDL-C above baseline was observed during the washout of evolocumab suggesting that compensatory mechanisms to increase production of PCSK9 and LDL-C do not occur during treatment. Subcutaneous regimens of 140 mg every 2 weeks and 420 mg once monthly were equivalent in average LDL-C lowering (mean of weeks 10 and 12) resulting in -72 to -57% from baseline compared with placebo. Treatment with Repatha resulted in a similar reduction of LDL-C when used alone or in combination with other lipid-lowering therapy. LDL-C reduction of approximately 55% to 75% was achieved with Repatha as early as week 1 and maintained during long-term therapy. Maximal response was generally achieved within 1 to 2 weeks after dosing with 140 mg every 2 weeks and 420 mg once monthly. Repatha was effective in all subgroups relative to placebo and ezetimibe, with no notable differences observed between subgroups, such as age, race, gender, region, body-mass index, National Cholesterol Education Program risk, current smoking status, baseline coronary heart disease (CHD) risk factors, family history of premature CHD, glucose tolerance status, (i.e. diabetes mellitus type 2, metabolic syndrome, or neither), hypertension, statin dose and intensity, unbound baseline PCSK9, baseline LDL-C and baseline TG. In 80-85% of all primary hyperlipidaemia patients treated with either dose, Repatha demonstrated a ≥ 50% reduction in LDL-C at the mean of weeks 10 and 12. Up to 99% of patients treated with either dose of Repatha achieved an LDL-C of < 2.6 mmol/L and up to 95% achieved an LDL-C < 1.8 mmol/L at the mean of weeks 10 and 12. LAPLACE-2 was an international, multicentre, double-blind, randomised, 12-week study in 1,896 patients with primary hypercholesterolaemia or mixed dyslipidaemia who were randomised to receive Repatha in combination with statins (rosuvastatin, simvastatin or atorvastatin). Repatha was compared to placebo for the rosuvastatin and simvastatin groups and compared with placebo and ezetimibe for the atorvastatin group. Repatha significantly reduced LDL-C from baseline to mean of weeks 10 and 12 compared with placebo for the rosuvastatin and simvastatin groups and compared with placebo and ezetimibe for the atorvastatin group (p < 0.001). Repatha significantly reduced TC, ApoB, non-HDL-C, TC/HDL-C, ApoB/ApoA1, VLDL-C, TG and Lp(a) and increased HDL-C from baseline to mean of weeks 10 and 12 as compared to placebo for the rosuvastatin and simvastatin groups (p < 0.05) and significantly reduced TC, ApoB, non-HDL-C, TC/HDL-C, ApoB/ApoA1 and Lp(a), compared with placebo and ezetimibe for the atorvastatin group (p < 0.001) (see tables 2 and 3). RUTHERFORD-2 was an international, multicentre, double-blind, randomised, placebo-controlled, 12-week study in 329 patients with heterozygous familial hypercholesterolaemia on lipid-lowering therapies. Repatha significantly reduced LDL-C from baseline to mean of weeks 10 and 12 compared with placebo (p < 0.001). Repatha significantly reduced TC, ApoB, non-HDL-C, TC/HDL-C, ApoB/ApoA1, VLDL-C, TG and Lp(a) and increased HDL-C and ApoA1 from baseline to mean of weeks 10 and 12 compared to placebo (p < 0.05) (see table 2). Key: Q2W = once every 2 weeks, QM = once monthly, HMD = Primary hypercholesterolaemia and mixed dyslipidaemia; HeFH = Heterozygous familial hypercholesterolaemia; a p value < 0.05 when compared with placebo. b p value < 0.001 when compared with placebo. GAUSS-2 was an international, multicentre, double-blind, randomised, ezetimibe-controlled, 12-week study in 307 patients who were statin-intolerant or unable to tolerate an effective dose of a statin. Repatha significantly reduced LDL-C compared with ezetimibe (p < 0.001). Repatha significantly reduced TC, ApoB, non-HDL-C, TC/HDL-C, ApoB/ApoA1 and Lp(a), from baseline to mean of weeks 10 and 12 compared to ezetimibe (p < 0.001) (see table 3). MENDEL-2 was an international, multicentre, double-blind, randomised, placebo and ezetimibe-controlled, 12-week study of Repatha in 614 patients with primary hypercholesterolaemia and mixed dyslipidaemia. Repatha significantly reduced LDL-C from baseline to mean of weeks 10 and 12 compared with both placebo and ezetimibe (p < 0.001). Repatha significantly reduced TC, ApoB, non-HDL-C, TC/HDL-C, ApoB/ApoA1 and Lp(a), from baseline to mean of weeks 10 and 12 compared with both placebo and ezetimibe (p < 0.001) (see table 3). Key: Q2W = once every 2 weeks, QM = once monthly, HMD = Primary hypercholesterolaemia and mixed dyslipidaemia, a p value < 0.05 when compared with ezetimibe, b p value < 0.001 when compared with ezetimibe, c nominal p value < 0.001 when compared with ezetimibe. DESCARTES was an international, multicentre, double-blind, randomised, placebo-controlled, 52-week study in 901 patients with hyperlipidaemia who received diet alone, atorvastatin, or a combination of atorvastatin and ezetimibe. Repatha 420 mg once monthly significantly reduced LDL-C from baseline at 52 weeks compared with placebo (p < 0.001). Treatment effects were sustained over 1 year as demonstrated by reduction in LDL-C from week 12 to week 52. Reduction in LDL-C from baseline at week 52 compared with placebo was consistent across background lipid-lowering therapies optimised for LDL-C and cardiovascular risk. Repatha significantly reduced TC, ApoB, non-HDL-C, TC/HDL-C, ApoB/ApoA1, VLDL-C, TG and Lp(a), and increased HDL-C and ApoA1 at week 52 compared with placebo (p < 0.001) (table 4). Key: QM = once monthly, a nominal p value < 0.001 when compared with placebo, b p value < 0.001 when compared with placebo. OSLER and OSLER-2 are two ongoing, randomised, controlled, open-label extension studies to assess the long-term safety and efficacy of Repatha in patients who completed treatment in a ‘parent’ study. In each extension study, patients were randomised 2:1 to receive either Repatha plus standard of care (evolocumab group) or standard of care alone (control group) for the first year of the study. At the end of the first year (week 52 in OSLER and week 48 in OSLER-2), patients were eligible to enter the all Repatha period in which all patients could receive open-label Repatha for either another 4 years (OSLER) or 1 year (OSLER-2). A total of 1,324 patients enrolled in OSLER. Repatha 420 mg once monthly significantly reduced LDL-C from baseline at week 12 and week 52 compared with control (nominal p < 0.001). Treatment effects were maintained over 124 weeks as demonstrated by reduction in LDL-C from week 12 in the parent study to week 112 in the open-label extension. A total of 2,928 patients enrolled in OSLER-2. Repatha significantly reduced LDL-C from baseline at week 12 compared with control (nominal p < 0.001). Treatment effects were maintained as demonstrated by reduction in LDL-C from week 12 to week 24 in the open-label extension. Repatha significantly reduced TC, ApoB, non-HDL-C, TC/HDL-C, ApoB/ApoA1, VLDL-C, TG and Lp(a), and increased HDL-C and ApoA1 from baseline to week 52 in OSLER and to week 24 in OSLER-2 compared with control (nominal p < 0.001). LDL-C and other lipid parameters returned to baseline within 12 weeks after discontinuation of Repatha at the beginning of OSLER or OSLER-2 without evidence of rebound. TAUSSIG is an ongoing multicentre, open-label, 5-year extension study to assess the long-term safety and efficacy of Repatha, as an adjunct to other lipid-lowering therapies, in patients with severe familial hypercholesterolaemia, including homozygous familial hypercholesterolaemia. A total of 102 severe familial hypercholesterolaemia patients and 96 homozygous familial hypercholesterolaemia patients enrolled in TAUSSIG. All patients in the study were initially treated with Repatha 420 mg once monthly, except for those receiving apheresis at enrolment who began with Repatha 420 mg once every 2 weeks. Dose frequency in non-apheresis patients could be titrated up to 420 mg once every 2 weeks based on LDL-C response and PCSK9 levels. Long-term use of Repatha demonstrated a sustained treatment effect as evidenced by reduction of LDL-C in patients with severe familial hypercholesterolaemia (table 5). Changes in other lipid parameters (TC, ApoB, non-HDL-C, TC/HDL-C, and ApoB/ApoA1) also demonstrated a sustained effect of long-term Repatha administration in patients with severe familial hypercholesterolaemia. Key: OLE = open-label extension, N (n) = Number of evaluable patients (N) and patients with observed LDL values at specific scheduled visit (n) in the severe familial hypercholesterolaemia interim analysis set. The long-term safety of sustained very low levels of LDL-C (i.e. < 0.65 mmol/L [< 25 mg/dL]) has not yet been established. Available data demonstrate that there are no clinically meaningful differences between the safety profiles of patients with LDL-C levels < 0.65 mmol/L and those with higher LDL-C, see section 4.8. TESLA was an international, multicentre, double-blind, randomised, placebo-controlled 12-week study in 49 homozygous familial hypercholesterolaemia patients aged 12 to 65 years. Repatha 420 mg once monthly, as an adjunct to other lipid-lowering therapies (e.g., statins, bile-acid sequestrants), significantly reduced LDL-C and ApoB at week 12 compared with placebo (p < 0.001) (table 6). Changes in other lipid parameters (TC, non-HDL-C, TC/HDL-C, and ApoB/ApoA1) also demonstrated a treatment effect of Repatha administration in patients with homozygous familial hypercholesterolaemia. Key: HoFH = homozygous familial hypercholesterolaemia, QM = once monthly, a nominal p value < 0.001 when compared with placebo, b p value < 0.001 when compared with placebo. In TAUSSIG, long-term use of Repatha demonstrated a sustained treatment effect as evidenced by reduction of LDL-C of approximately 20% to 30% in patients with homozygous familial hypercholesterolaemia not on apheresis and approximately 15% to 25% in patients with homozygous familial hypercholesterolaemia on apheresis (table 7). Changes in other lipid parameters (TC, ApoB, non-HDL-C, TC/HDL-C, and ApoB/ApoA1) also demonstrated a sustained effect of long-term Repatha administration in patients with homozygous familial hypercholesterolaemia. Reductions in LDL-C and changes in other lipid parameters in 13 adolescent patients (aged ≥ 12 to < 18 years) with homozygous familial hypercholesterolaemia are comparable to those in the overall population of patients with homozygous familial hypercholesterolaemia. Key: OLE = open-label extension. N (n) = Number of evaluable patients (N) and patients with observed LDL values at specific schedule visit (n) in the HoFH interim analysis set. The effects of Repatha 420 mg once monthly on atherosclerotic disease burden, as measured by intravascular ultrasound (IVUS), were evaluated in a 78-week double-blind, randomised, placebo controlled study in 968 patients with coronary artery disease on a stable background of optimal statin therapy. Repatha reduced both percent atheroma volume (PAV; 1.01% [95% CI 0.64, 1.38], p < 0.0001) and total atheroma volume (TAV; 4.89 mm3 [95% CI 2.53, 7.25], p < 0.0001) compared with placebo. Atherosclerotic regression was observed in 64.3% (95% CI 59.6, 68.7) and 47.3% (95% CI 42.6, 52.0) of patients who received Repatha or placebo respectively when measured by PAV. When measured by TAV, atherosclerotic regression was observed in 61.5% (95% CI 56.7, 66.0) and 48.9% (95% CI 44.2, 53.7) of patients who received Repatha or placebo respectively. The study did not investigate the correlation between atherosclerotic disease regression and cardiovascular events. 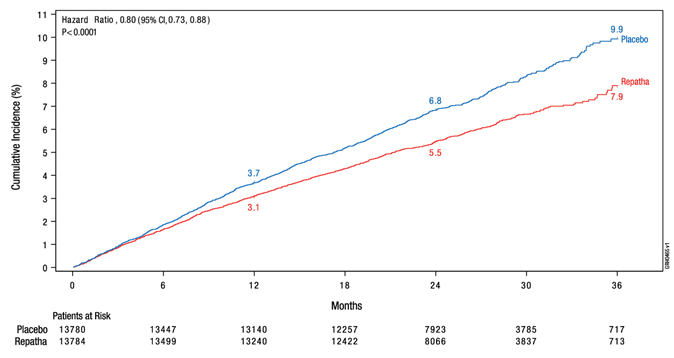 The Repatha Outcomes Study (FOURIER) was a randomised, event-driven, double-blind study of 27,564 subjects, aged between 40 and 86 years (mean age 62.5 years), with established atherosclerotic CV disease; 81% had a prior MI event, 19% had a prior stroke event and 13% had peripheral arterial disease. Over 99% of patients were on moderate to high intensity statin and at least one other cardiovascular medicine such as anti-platelet agents, beta blockers, ACE inhibitors, or angiotensin receptor blockers; median (Q1, Q3) baseline LDL-C was 2.4 mmol/L (2.1, 2.8). Absolute CV risk was balanced between treatment groups, in addition to the index event all patients had at least 1 major or 2 minor CV risk factors; 80% had hypertension, 36% had diabetes mellitus, and 28% were daily smokers. Patients were randomised 1:1 to either Repatha (140 mg every two weeks or 420 mg once every month) or matching placebo; the mean duration of patient follow-up was 26 months. A substantial reduction of LDL-C was observed throughout the study, with achieved median LDL-C ranges of 0.8 to 0.9 mmol/L at each assessment; 25% of patients achieved a LDL-C concentration less than 0.5 mmol/L. Despite the very low levels of LDL-C achieved, no new safety issues were observed (see section 4.8); the frequencies of new onset diabetes and cognitive events were comparable in patients who achieved LDL-C levels < 0.65 mmol/L and those with higher LDL-C.
Repatha significantly reduced the risk of cardiovascular events defined as the composite of time to first CV death, MI, stroke, coronary revascularisation, or hospitalisation for unstable angina (see table 8); the Kaplan-Meier curves for the primary and key secondary composite endpoints separated at approximately 5 months (see figure 1 for the MACE three year Kaplan-Meier curve). The relative risk of the MACE composite (CV death, MI, or stroke) was significantly reduced by 20%. The treatment effect was consistent across all subgroups (including age, type of disease, baseline LDL-C, baseline statin intensity, ezetimibe use, and diabetes) and was driven by a reduction in the risk of myocardial infarction, stroke and coronary revascularisation; no significant difference was seen on cardiovascular or all-cause mortality however the study was not designed to detect such a difference. a Based on a Cox model stratified by the randomisation stratification factors collected via IVRS. b 2-sided log-rank test stratified by randomisation stratification factors collected via IVRS. d The treatment effect on stroke was driven by a reduction in risk of ischaemic stroke; there was no effect on haemorrhagic or undetermined stroke. e Assessment of time to hospitalisation for unstable angina was ad-hoc. The European Medicines Agency has waived the obligation to submit the results of studies with Repatha in all subsets of the paediatric population in the treatment of mixed dyslipidaemia. The European Medicines Agency has deferred the obligation to submit the results of studies with Repatha in one or more subsets of the paediatric population in the treatment of elevated cholesterol. There are limited data available on the use of Repatha in the paediatric population. Fourteen adolescent patients aged ≥ 12 to < 18 years with homozygous familial hypercholesterolaemia have been included in clinical trials. No overall differences in safety or efficacy were observed between adolescent and adult patients with homozygous familial hypercholesterolaemia. See section 4.2 for information on paediatric use. Following a single subcutaneous dose of 140 mg or 420 mg Repatha administered to healthy adults, median peak serum concentrations were attained in 3 to 4 days. Administration of single subcutaneous dose of 140 mg resulted in a Cmax mean (SD) of 13.0 (10.4) μg/mL and AUClast mean (SD) of 96.5 (78.7) day•μg/mL. Administration of single subcutaneous dose 420 mg resulted in a Cmax mean (SD) of 46.0 (17.2) μg/mL and AUClast mean (SD) of 842 (333) day•μg/mL. Three subcutaneous 140 mg doses were bioequivalent to a single subcutaneous 420 mg dose. The absolute bioavailability after SC dosing was determined to be 72% from pharmacokinetic models. Following a single 420 mg Repatha intravenous dose, the mean (SD) steady-state volume of distribution was estimated to be 3.3 (0.5) L, suggesting evolocumab has limited tissue distribution. Repatha is composed solely of amino acids and carbohydrates as native immunoglobulin and is unlikely to be eliminated via hepatic metabolic mechanisms. Its metabolism and elimination are expected to follow the immunoglobulin clearance pathways, resulting in degradation to small peptides and individual amino acids. Evolocumab was estimated to have an effective half-life of 11 to 17 days. In patients with primary hypercholesterolaemia or mixed dyslipidaemia on high dose statin, the systemic exposure of evolocumab was slightly lower than in subjects on low-to-moderate dose statin (the ratio of AUClast 0.74 [90% CI 0.29; 1.9]). An approximately 20% increase in the clearance is in part mediated by statins increasing the concentration of PCSK9 which did not adversely impact the pharmacodynamic effect of evolocumab on lipids. Population pharmacokinetic analysis indicated no appreciable differences in evolocumab serum concentrations in hypercholesterolaemic patients (non-familial hypercholesterolaemia or familial hypercholesterolaemia) taking concomitant statins. Following a single 420 mg intravenous dose, the mean (SD) systemic clearance was estimated to be 12 (2) mL/hr. In clinical studies with repeated subcutaneous dosing over 12 weeks, dose proportional increases in exposure were observed with dose regimens of 140 mg and greater. An approximate two to three-fold accumulation was observed in trough serum concentrations (Cmin (SD) 7.21 (6.6)) following 140 mg doses every 2 weeks or following 420 mg doses administered monthly (Cmin (SD) 11.2 (10.8)), and serum trough concentrations approached steady-state by 12 weeks of dosing. No time dependent changes were observed in serum concentrations over a period of 124 weeks. No dose adjustment is necessary in patients with mild to moderate renal impairment. Population pharmacokinetic analysis of integrated data from the Repatha clinical trials did not reveal a difference in pharmacokinetics of evolocumab in patients with mild or moderate renal impairment relative to non-renally impaired patients. There is limited experience with Repatha in patients with severe renal impairment (see section 4.4). No dose adjustment is necessary in patients with mild hepatic impairment (Child-Pugh class A). Single 140 mg subcutaneous doses of Repatha were studied in 8 patients with mild hepatic impairment, 8 patients with moderate hepatic impairment and 8 healthy subjects. The exposure to evolocumab was found to be approximately 40-50% lower compared to healthy subjects. However, baseline PCSK9 levels and the degree and time course of PCSK9 neutralisation were found to be similar between patients with mild or moderate hepatic impairment and healthy volunteers. This resulted in similar time course and extent of absolute LDL-C lowering. Repatha has not been studied in patients with severe hepatic impairment (Child-Pugh class C) (see section 4.4). Body weight was a significant covariate in population PK analysis impacting evolocumab trough concentrations, however there was no impact on LDL-C reduction. Following repeat subcutaneous administration of 140 mg every 2 weeks, the 12-week trough concentrations were 147% higher and 70% lower in patients of 69 kg and 93 kg respectively, than that of the typical 81 kg subject. Less impact from body weight was seen with repeated subcutaneous evolocumab 420 mg monthly doses. Population pharmacokinetic analyses suggest that no dose adjustments are necessary for age, race or gender. The pharmacokinetics of evolocumab were influenced by body weight without having any notable effect on LDL-C lowering. Therefore, no dose adjustments are necessary based on body weight. Evolocumab was not carcinogenic in hamsters at exposures much higher than patients receiving evolocumab at 420 mg once monthly. The mutagenic potential of evolocumab has not been evaluated. In hamsters and cynomolgus monkeys at exposures much higher than patients receiving 420 mg evolocumab once monthly, no effect on male or female fertility was observed. In cynomolgus monkeys at exposures much higher than patients receiving 420 mg evolocumab once monthly, no effects on embryo-foetal or postnatal development (up to 6 months of age) were observed. Apart from a reduced T-cell Dependent Antibody Response in cynomolgus monkeys immunised with keyhole limpet haemocyanin (KLH) after 3 months of treatment with evolocumab, no adverse effects were observed in hamsters (up to 3 months) and cynomolgus monkeys (up to 6 months) at exposures much higher than patients receiving evolocumab at 420 mg once monthly. The intended pharmacological effect of decreased serum LDL-C and total cholesterol were observed in these studies and was reversible upon cessation of treatment. In combination with rosuvastatin for 3 months, no adverse effects were observed in cynomolgus monkeys at exposures much higher than patients receiving 420 mg evolocumab once monthly. Reductions in serum LDL-C and total cholesterol were more pronounced than observed previously with evolocumab alone, and were reversible upon cessation of treatment. Store in a refrigerator (2°C – 8°C). Do not freeze. Keep in the original carton in order to protect from light. Keep in the original carton in order to protect from light and moisture. If removed from the refrigerator, Repatha may be stored at room temperature (up to 25°C) in the original carton and must be used within 1 month. One mL solution in a single use pre-filled syringe made from type I glass with stainless steel 27 gauge needle. The needle cover of the pre-filled syringe is made from dry natural rubber (a derivative of latex, see section 4.4). Pack size of one pre-filled syringe. One mL solution in a single use pre-filled pen made from type I glass with stainless steel 27 gauge needle. The needle cover of the pre-filled pen is made from dry natural rubber (a derivative of latex, see section 4.4). Pack sizes of one, two, three or multipack of six (3×2) pre-filled pens. A 3.5 mL solution in a single use cartridge made from cyclic olefin polymer with elastomer septum and piston as product-contact materials, and a resin cap. The pre-filled cartridge is assembled with a telescopic screw device component. The cartridge assembly is co-packed with an administration device. The fluid path within the administration device is made from stainless steel and non-DEHP polyvinyl chloride, with a stainless steel 29 gauge needle. The administration device contains silver oxide-zinc batteries and includes an adhesive patch made from polyester tape with an acrylate adhesive. The administration device is designed for use only with the provided 3.5 mL pre-filled cartridge assembly. Pack sizes of one cartridge/automated mini-doser or multipack of three (3×1) cartridges/automated mini-dosers. Before administration, the solution should be inspected. Do not inject the solution if it contains particles, or is cloudy or discoloured. To avoid discomfort at the site of injection, allow the medicine to reach room temperature (up to 25°C) before injecting. Inject the entire contents.